← 1772 small ads: A bit of help, please? Snipe are quite scarce birds, certainly not a common sight in these parts. Who'd do such a thing? Picture supplied by Sarah Brookes. Wildlife lover and friend of the Brownhills Blog Sarah Brooks has been in touch and asked me to feature this grizzly and shocking find on the blog. I’m glad to do so, as the mindless, destructive scum who shoot wildlife like this deserve our scorn. 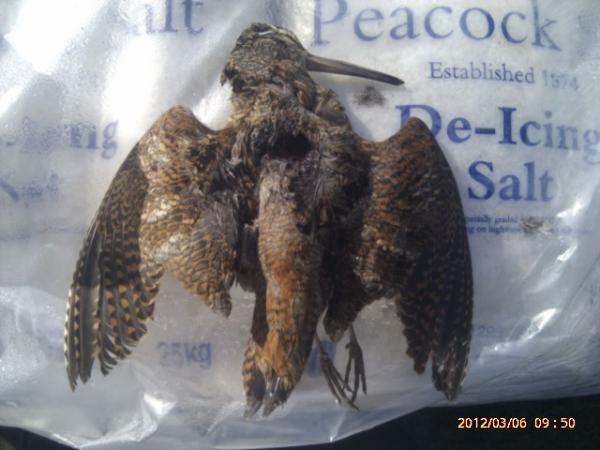 Sarah had found a Snipe, shot dead near Aldridge Church on 6th March 2012. Snipe are not very common birds in these parts and I can’t imagine, other than pure devilment, why anyone would want to kill such a bird. I note that Graham Evans, on Chasewater Wildlife Group’s daily diary, records a pair of the birds at Chasewater last weekend (18th March 2012). Sarah has informed the RSPB and police. 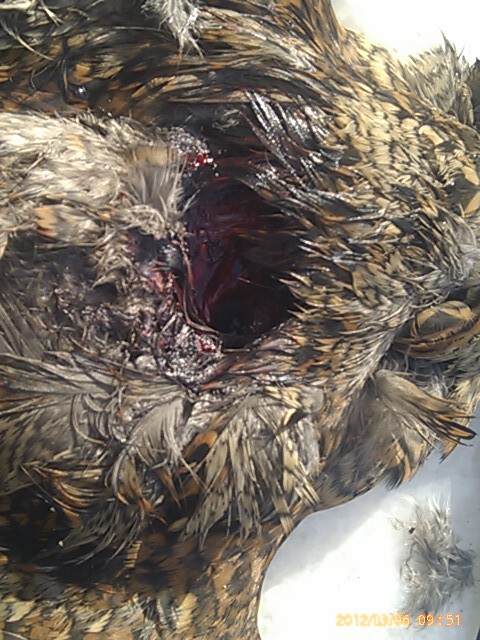 Please, if you know who’s shooting birds in this way, please ask them to stop. It’s not big, not clever and can only harm the environment in the long run. Clearly a gunshot wound. Picture supplied by Sarah Brookes. This entry was posted in Environment, Events, Interesting photos, It makes me mad!, Local media, News, Reader enquiries, Shared media, Social Media, Spotted whilst browsing the web, Walsall community, Wildlife and tagged Aldridge, Chasewater, Chasewater Wildlife Group, gunshot, hunting, New Photos, Police, RSPB, Sarah Brookes, shooting, shot, Snipe, Twitter, Vandalism, Wildlife. Bookmark the permalink. Thank you for the blog. I’ve still had no news from the police but they have taken the photos. I really appreciate what you’ve done for me. I’m just so disappointed that someone could do such a thing.